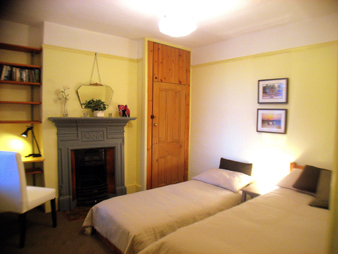 We have a stylish double with a king size bed and also a single/twin room. 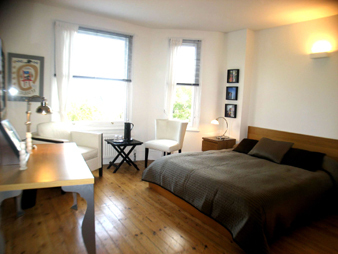 Both rooms have flat screen LCD televisions and free wifi. 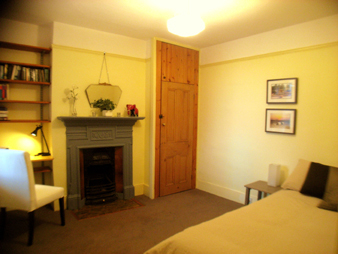 You can book the double room on its own with exclusive use of the bathroom or book both rooms and share the bathroom - perfect for a family of three or four. 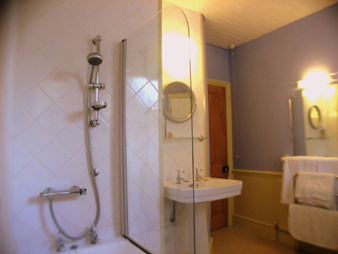 Because the bathroom is shared between the two rooms, we do not take bookings for the single room alone. The single room has a pull-out bed to make it into a twin room. Both rooms are on the first floor. A travel cot that fits into the double room is available and there is no extra charge for infants under two, when sharing the double room. You'll find our room rates on the Booking page. We're a smoke-free home.